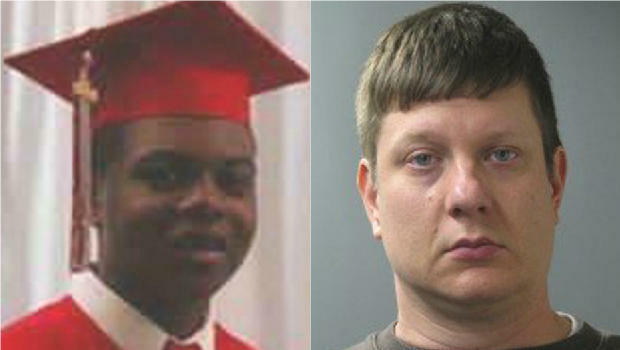 A white police officer who killed a black teenager four years ago in Chicago has been found guilty of second-degree murder. Jason Van Dyke shot Laquan McDonald 16 times, seconds after arriving on the scene, saying he feared for his life as the 17-year-old had a knife. Van Dyke was charged with first-degree murder, but has been convicted of the lesser charge. Chicago was braced for protests. The 20 October 2014 shooting sparked outcry. Van Dyke was also found guilty on all 16 counts of aggravated battery with a firearm – one count per shot fired. The jury found him not guilty of official misconduct. His bail was revoked and he was taken into custody following the verdict. Van Dyke now faces a minimum of six years in prison and a maximum of over 15 years, with the possibility of probation. The jury of eight women and four men – one African-American, seven white, one Asian-American and three Hispanic – started deliberations on Thursday afternoon. Three other Chicago officers were charged last year with allegedly conspiring to cover up the fatal shooting, and they will be tried later this year. Mr Van Dyke was arrested in 2015 after dashcam footage appeared to show him fatally shooting Mr McDonald as he moved away from officers, contradicting official accounts. He was the first Chicago officer to be charged with first-degree murder since 1980. According to prosecutors, Mr McDonald was holding a knife with a 3in (7.6cm) blade when he was stopped by police. Police said he had slashed a tyre on a patrol car, resulting in a stand-off between the teenager and officers. Van Dyke was not among the first officers to arrive – the officer who reached the scene first told prosecutors he saw no need to use force on Mr McDonald. Prosecutors say Van Dyke proceeded to open fire on Mr McDonald less than six seconds after he exited his patrol car, and he was the only officer to use his weapon. Mr McDonald still had a pulse when paramedics arrived, but was declared dead in hospital. A judge ordered police to release the dashcam footage in November 2015 after the Democratic city leader’s administration fought to withhold the video for a year. The clip resulted in mass protests, culminating with the dismissal of the police chief and a Department of Justice investigation into the Chicago Police Department’s use of force. The justice department issued a report last year that found the police had routinely violated the constitutional rights of the city’s residents. Police superintendent Garry McCarthy was ousted and the county’s top prosecutor, Anita Alvarez, lost her re-election bid amid harsh criticism of her investigation into the incident. In September, ahead of Mr Van Dyke’s trial, Mayor Emanuel announced he would not run for re-election.